Henrietta Lacks was born with the name “Loretta Pleasant” in August 1920 in Roanoke, Virginia; no one knows when she became Henrietta. A midwife called Fannie delivered her in the tiny family house. Her mother, Eliza Lacks Pleasant, died in childbirth four years later. Afterwards her father, Johnny Pleasant, took his children back to the family home of Clover, Virginia. The relatives divided the children up, and Henrietta was given to Tommy Lacks, her grandfather. Skloot now jumps back further, all the way to Henrietta’s birth. Although this portion of the narration has nothing to do with HeLa or science, it has everything to do with our understanding of Henrietta and her family. Skloot also introduces the setting of Clover here, as a symbolic place of innocence and family. Tommy Lacks’house was a four-room log cabin which had once served as a slave quarters. He was already raising another older grandchild named David Lacks, whom everyone called “Day.” Originally pronounced dead by a white doctor because he wasn’t breathing, David eventually revived. Skloot continues to show that she cares as much about the people in her narrative as she does about scientific information. Henrietta grew up in a world that was essentially an extension of Southern slavery—she and her family members had no real opportunity for education or skilled work, and were forced to work at hard labor all day from a young age. Though this was a world of systemic racism and poverty, the Lacks children still had their idyllic, innocent moments growing up. Clover has a Main Street where, on nice days, the white members of the town would loiter and gossip. Henrietta and her cousins would hire themselves out there, harvesting tobacco in order to get money for the movies, where they would sit in the “colored” section. Skloot continues to emphasize the discrimination that Henrietta faced because of her race, while also bringing up the theme of poverty. Such questions are crucial to understanding why Henrietta has been erased from history. Henrietta and Day grow older, racing horses along the dirt road that runs through the former Lacks tobacco plantation (now called Lacks Town). They have a cousin named Crazy Joe Grinnan who is desperately in love with Henrietta—“the prettiest girl in Lacks Town”—and is called “Crazy” because he’ll do anything for her. Crazy Joe, however, didn’t stand a chance, as Henrietta and Day had been sharing a bedroom since she was four, and she has their first child—Lawrence—when she’s fourteen. Four years later, she gives birth to Lucile Elsie Pleasant, called Elsie. Even as she brings up heavy themes of race and class, Skloot also uses a light touch to describe youthful love. In narrating the story of how Day and Henrietta met, Sklootmore fully humanizes them as characters, making the ensuing story of Henrietta’s cells seem all the more poignant. The introduction of Elsie is an important moment. While Henrietta’s death is one tragedy of the Lacks family, Elsie’s illness and death are another. When he finds out that Henrietta is going to marry Day, Crazy Joe Grinnan stabs himself. Eventually his father ties him up and takes him to the doctor. Henrietta’s sister Gladys also tries to stop the marriage. Some believe that Gladys is jealous of Henrietta’s good looks, while Gladys herself asserts that Day isn’t good enough. Henrietta’s life was already dramatic and far from perfect even before her disease. Skloot gives us more details to help us get a sense of Lacks Town and the Lacks family. Henrietta and Day get married on April 10, 1941. Soon after, the U.S. enters WWII, and the tobacco farm suffers. The author now introduces Fred and Cliff Garret, cousins to the Lackses. Fred lives near Baltimore and works at Bethlehem Steel’s Sparrows Point steel mill. He lives in a black settlement called Turner Station. After Pearl Harbor, demand for steel soars and Sparrows Point becomes the largest steel plant in the world. Black men take on hard and dangerous jobs, inhaling toxic coal dust and asbestos and making far less than their white counterparts. Now that Skloot has made the story of the Lackses small and personal, she goes on to expand her focus and explore the effect of a wartime economy on African American laborers. Skloot also takes this opportunity to note the inequality between black and white workers’ jobs—just one more example of how the health of black Americans was a very low priority to the white establishment at the time. Fred has returned to Clover to try to convince Henrietta and Day to come back to Turner Station with him. The men decide that Henrietta should stay behind and take care of the children and the farm until Day has made enough money for a house. A few months afterwards, Fred gets drafted, and he gives Day the money he’s saved so that Henrietta and her children can come to Turner Station. And so at age twenty-one, Henrietta leaves Clover and her family home. Henrietta’s move away from Clover is a symbolically important one—she is leaving behind not only her family, but also her childhood home. For the rest of the book, Clover will emblemize lost innocence and togetherness. Hoyt-Disick, Gabrielle. "The Immortal Life of Henrietta Lacks Chapter 2: Clover." LitCharts. LitCharts LLC, 29 Jun 2016. Web. 22 Apr 2019. Hoyt-Disick, Gabrielle. 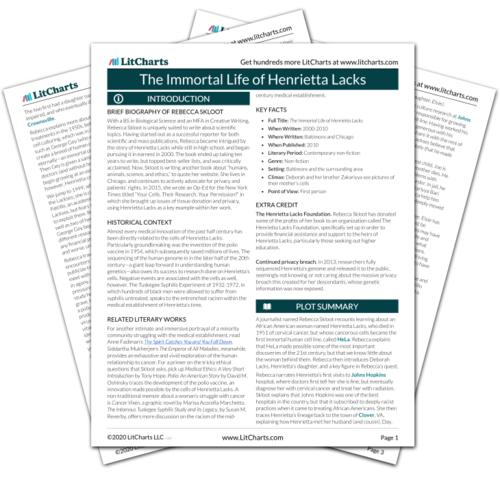 "The Immortal Life of Henrietta Lacks Chapter 2: Clover." LitCharts LLC, June 29, 2016. 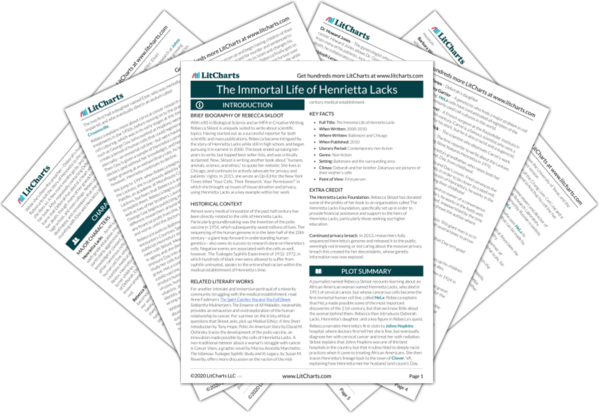 Retrieved April 22, 2019. https://www.litcharts.com/lit/the-immortal-life-of-henrietta-lacks/chapter-2-clover.